This program is useful for the sick and elderly, people with irritable bowel syndrome, diagnosing allergies, crones, colitis, bowel diseases or people with a low immune system. 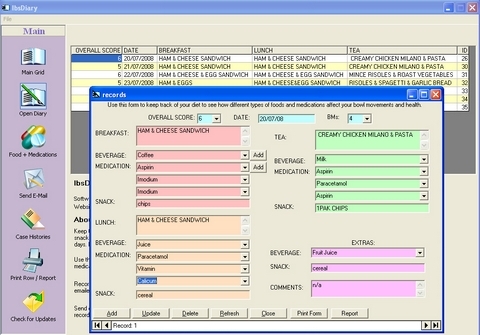 Keep track of your food, eating habits, medications & bowel movements with this easy to use software. Also suitable for doctors, nurses, specialists and teachers. Record your daily meals, medications, beverages and bowel movements. Keep a detailed list of foods and medications that can and can’t be taken. Have a Case History file that can be printed or emailed to your doctor or specialist. No more lost sheets of paper when all the data is contained in this easy to use software. Print or email records from within the software to your doctor, specialist, nurse or teacher. You will receive an unlock key and a download link electronically immediately after ordering! Khaled Club is the right place to start new life as an athletic, strong and healthy person with a strong will. March 8, 2016 Health & Nutrition, Home & Education, SoftwareEdward A. Greenwood, Inc.
Weightmania Pro is the most comprehensive fitness journal on the market. It tracks detailed exercise, nutrition, calories, weight loss, diabetes and health information. Track up to 24 measurements daily including blood sugar (diabetes), blood pressure, cholesterol, sleep and body fat. This includes body fat caliper measurements. It supports both cardio and weight training, accommodates any workout or diet plan, and tracks up to two people (other versions are available that track more). Visualize your progress, judge the effectiveness of diets and workouts, and reach goals sooner. Includes a journal for recording up to a 120 details per day and over 20 tools. 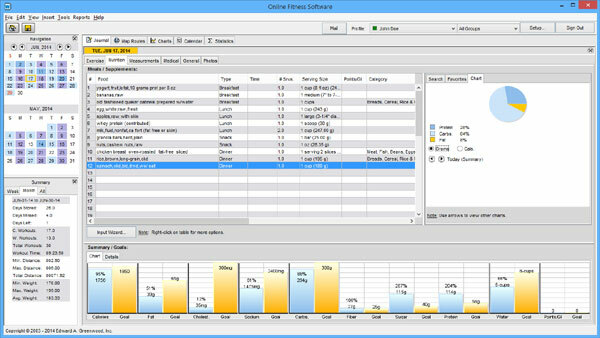 These include graphs, charts, calendars, reports, statistics, a large nutrition database, 12 fitness calculators, a powerful search, data import/export tools, tools to create pre-defined meal programs (menus), pre-defined workout programs (templates) and your own custom food database. On top of this, there are tools to track and manage recipes, grocery lists, favorite Web links, equipment and routes. Look up nutrients in any food, and instantly compare daily nutritional intake against your goals. Edit and store digital photos for any calendar day (makes it easy to visualize progress over time). 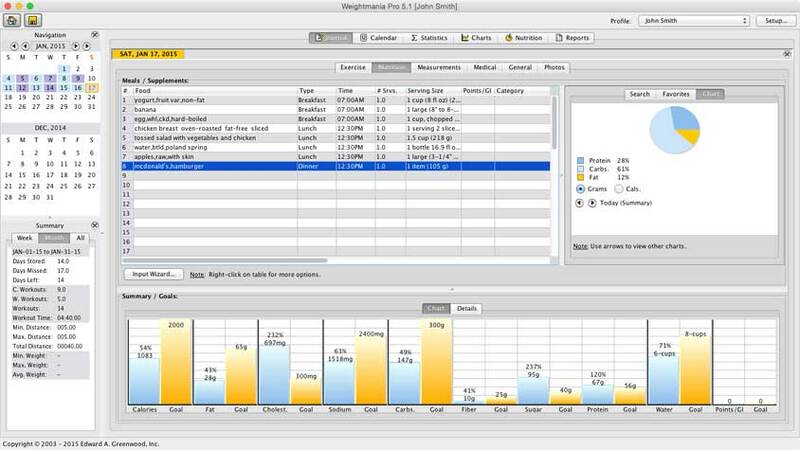 Calculates the calories you need to cut or burn to reach a weight goal by a specific date, calories burned for any activity, daily calories required, percent body fat, body mass index (BMI), basal Metabolic rate (BMR), target heart rate, one-rep maximum weight, distance-time-pace-speed and splits. 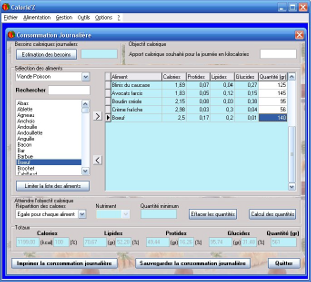 A 42-key calculator performs dozens of calculations and Metric to English conversions. Create line, bar, area, and moving average graphs. Compare data on multiple graphs simultaneously. Provides multiple ways to minimize data entry time, including copy and paste, drag and drop and input wizards. Designed for anyone interested in improving their health and well being. 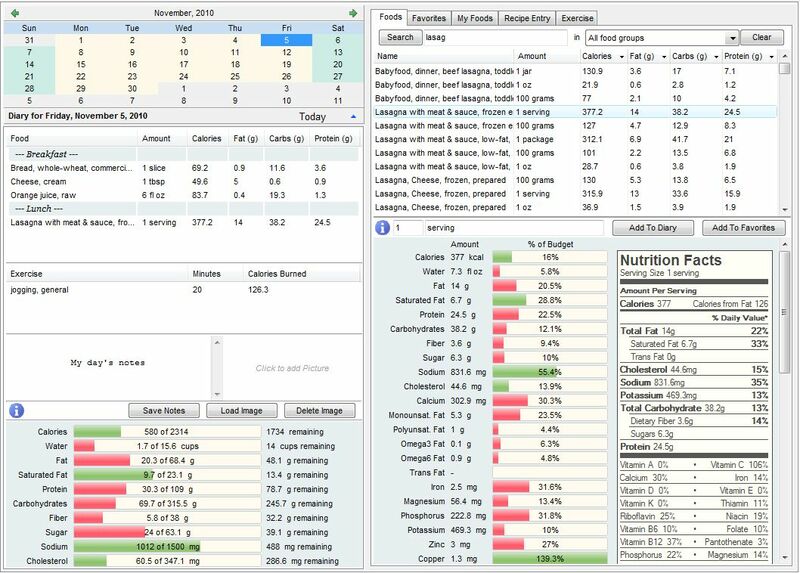 Calorie’Z is a nutrition software that also manages your recipes. Its database contains more than 250 native recipes and gives you the details of their nutritional intake. The main functions of Calorie’Z: – Determining your “calorie target”, regardless of your needs estimation and calculation of quantities for the food you selected to achieve this “calorie target” while meeting the nutritional criteria you selected. – Management (adding and editing) foods used as ingredients in recipes and calculate your daily calorie intake. – Manage photos recipes. – Search recipes based on multiple criteria (caloric value, category, recipes whose names begin with…). – Managing multiple user profiles. Many people may well proceed to estimate their daily caloric needs by selecting the parameters of their own. – Conversion of volume to weight and Conversion in grams amounts of other units of measurements. – Conversion of grams quantities in other units of measurement. – Ability to save the caloric intake of the day. – Ability to display a report of calorie intake and major nutrient for a period. – Calculation of body mass index. 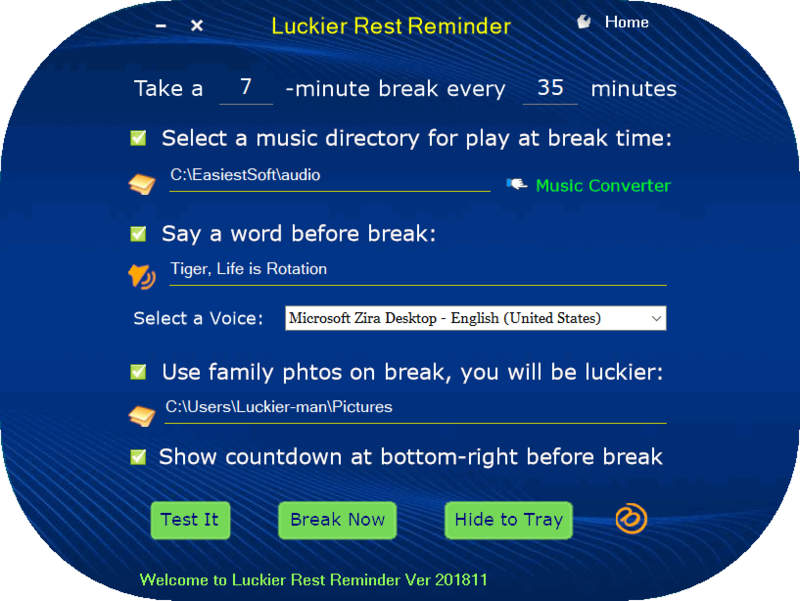 – Automatic detection of software updates. My Diet Wiz is weight and nutrition software designed to help you lose weight, get in shape and eat a balanced diet. The program’s functions calculate calorie intake targets to keep you at, or get you to the weight you want. The program features a list of 20,000+ foods with information on numerous nutrients such as Trans fat, and Omega3, Omega6 fats. Included is a large list of exercises, and ability to record body measurements. Get informed about your diet, and make it easier to achieve your goals.